Home > Projects > Counting Us In- Human Rights Count! To mark International Day Against Racism, Counting Us In-Human Rights Count hosted an information seminar on ethnic data collection attended by over 70 people at the Gibson Hotel. (LtoR) Anastasia Crickley, CERD; Diane Nurse HSE; Ronnie Fay, Pavee Point; Lynsey Kavanagh, Pavee Point; Martin Collins, Pavee Point and Andrew Millard, NHS Scotland. Lynsey Kavanagh, Pavee Point Policy and Evaluation Worker gave an insightful presentation on the Research Report. You can see Lynsey’s PowerPoint presentation here. 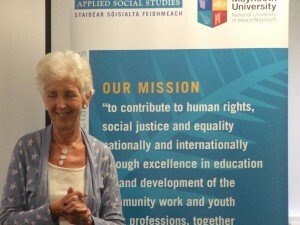 Anastasia Crickley, Vice-President, UN Committee for the Elimination of Racial Discrimination (CERD) pointed out that the State has a responsibility as duty bearers to create conditions for achieving Human Rights regardless of resources and funding. Ronnie Fay reiterated that, as stated in the Durban Declaration 15 years ago, combating racism is primarily the responsibility of the State. Andrew Millard, Equalities Intelligence Manager, Scottish Public Health Observatory NHS Health Scotland spoke of the Scottish experience and explained how ethnic data collection had helped to highlight the health issues for minority ethnic groups. In closing the seminar Diane Nurse of the National Social Inclusion Office of the Health Service Executive reaffirmed their committment to ethnic data collection – not just within social inclusion measures but as a mainstream activity of the HSE. You can see Andrew Millard’s Power Point presentation here and watch his presentation below. This is the second half of his presentation. 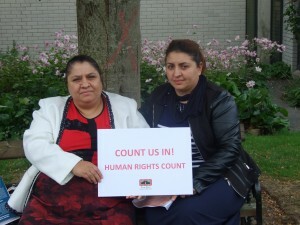 This project is part of an ongoing campaign for ethnic data collection within a human rights framework in Ireland by Pavee Point Traveller and Roma Centre. This one year project funded by the Open Society Foundation, focuses on advocating for the inclusion of an ethnic identifier in official data collection in Ireland; and where this takes place that implementation, monitoring and evaluation are in line with relevant human rights standards. This is central to monitoring and therefore combatting anti-Traveller and Roma discrimination and promoting equality of access, opportunity and outcome for members of the communities. – Engage with state actors to ensure that relevant stakeholders are equipped, confident and skilled in implementing, monitoring and evaluating ethnic data; and can apply human rights principles, practices and processes to ethnic data collection. – Generate awareness within Traveller and Roma communities about disaggregated data collection to combat low levels of disclosure of ethnic identity. – Build from community development principles, ensuring the active participation and consultation of Travellers and Roma at all stages of the project in order to generate effective and sustainable change. Throughout the project, a range of policy materials on ethnic data collection will be developed for all stakeholders. A series of national seminars will take place and training workshops for Traveller, Roma and other relevant stakeholders will be run. Direct meetings with relevant stakeholders will also take place. A reference group with representatives from the named stakeholders will meet throughout the project to shape this work. Learning will be documented and shared and disseminated at national and EU levels to benefit Traveller, Roma and other minority ethnic communities. Why is ethnic data collection a priority? Research and anecdotal evidence show that Travellers and Roma are one of the most marginalised and impoverished groups in Ireland. As elsewhere in Europe, anti-Traveller and Roma discrimination, racism and prejudice are widespread and deep-rooted. Travellers and Roma are subjected to both indirect and direct discrimination, which results in inequality of opportunities, access and outcomes in employment, social protection, education, health and accommodation. Stasia Crickley, Maynooth University speaking at ‘Counting Us In’ seminar. Currently, ethnicity is not included as an administrative category in official data collection systems. This results in serious gaps in knowledge about the situation and needs of Travellers and Roma and absence of evidence based policies and practices to ensure the needs of minority ethnic communities are met. 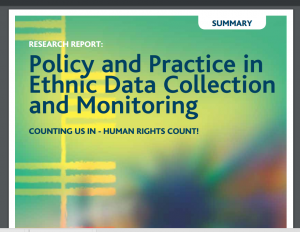 Previous efforts to collect ethnic data in Ireland have been largely conducted outside relevant human rights standards and breach data protection principles. Often ethnicity has often been ascribed by a data collector to minority ethnic groups including Travellers and Roma, rather than the application of a universal question on ethnicity through voluntary self-identification. Information is not disaggregated or made available in timely manner to the relevant stakeholders. Ethnic data collection and analysis, would allow for evidence based policy-making and measurement of policy outcomes for Travellers and Roma, including the monitoring of mainstream initiatives. It can identify where discrimination and racism is occurring and promote equality of access and outcomes from services. 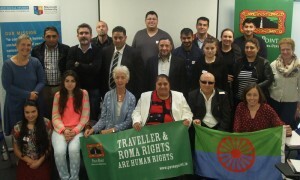 A Steering Group drives the project and key representatives of statutory and other stakeholders have been invited to participate on a National Traveller and Roma Reference Group. 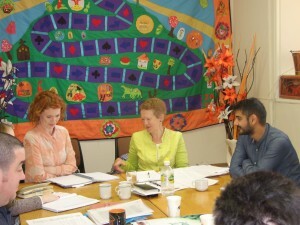 Hilary Harmon, Pavee Point; Nuala Kelly, ‘Counting Us In’ Co-Ordinator; Alex Petrovics, Roma Enniscorthy at ‘Counting Us In’ meeting. In September 2015 two seminars were held to highlight the importance of ethnic data collection in Community Development . One was with Traveller leaders and one was with Roma leaders. – Ethnic Data Collection and Community Development, Maynooth University.